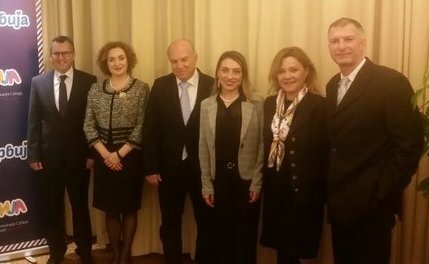 The presentation of the tourist potentials of Serbia was held at Hilton Hotel, Tel Aviv, on February 7th, with the support of the Embassy of the Republic of Serbia in Israel. The presentation was organized by the Tourist Organization of Serbia (TOS) and the Tourist Organization of Belgrade (TOB), in partnership with the OpenSky Israel Agency, with the participation of representatives of tourist organizations from Serbia who took part in the International Tourism Exhibition IMTM 2018, a large number of representatives from israeli turist sector and representatives of the media. In his address, Ambassador Milutin Stanojevic highlighted the high level of tourism exchange, especially from Israel towards Serbia, achieved in the past year, with the emphasis that the growing trend is especially present in the past year when there was an increase of 195% in the number of overnight stays of Israeli tourists (Israel second by number of overnight stays in Belgrade, and 11th in Serbia). On this occasion, Ambassador emphasized that Serbia has always had friendly relations with Israel, but that in the last few years, more than ever, it has become a very attractive location for Israeli tourists, thanks to the promotion of this kind - through the gathering of the most important tourist representatives of both countries in one place at presentations and fairs, but also through active and continuous promotion of Serbia's tourist advantages throughout the year. He welcomed the efforts in order to further enhance tourism cooperation and invited the Israeli side to continue promoting and discovering Serbia as a suitable tourist destination, in support to a positive trend in tourism cooperation. Presentations on the tourist offer of Serbia were held by Marija Labović, Director of TOS and Jelena Stankovic, from the Public Relations Department at TOB. On this occasion, direct talks (B2B meetings) of Israeli and Serbian tourist representatives were held, with in order to concretize proposals for improving cooperation in the field of tourism.